A World of Englishes: English: no longer an official EU language? As I understand it English in multilingual post-colonial situations seems to have survived in order to avoid one internal language being seen as dominant within the post-colonial state. English in this situation is more neutral, and by taking it on as part of the new dispensation, different areas are able to unite in the post-colonial situation. But following Brexit, will English in the EU have connotations of rejection and failure, and thus be seen to be disruptive and effectively antagonistic? Europe was never part of a British empire, or even an American empire (though there might be a case for saying that following the Second World War Western Europe became in effect part of an American economic empire), so the situation is rather different. If negotiations see the UK perceived as the catalyst for partial collapse of the EU, or as hectoring the EU into what it wants, I wonder if the English language baby may be thrown out with the UK bathwater. Yes, I think this is the concern, Julian. But English has a life of its own. It may not be kept as an official language in the EU, but I can't see it ever not being a working language. Thanks for the link, Sidney. Wenn Donald Johnson und Boris Trump populistisch-nationalistische FÜHRER ihrer jeweiligen Staaten werden, sehe ich schwarz für das Prestige des Englischen in der EU. Wie das Lateinische wird es zwar lange dauern, bis es aus dem alltäglichen Sprachgebrauch verschwindet, aber es wird keine Chance haben gegen Französisch in Süd- und Westeuropa, und Deutsch in Mittel- und Osteuropa. Und weltweit wahrscheinlich auch nicht gegen Spanisch und Standardchinesisch. Pues la verdad es que no sé qué decirte; no sé si me entiendes. Porque, claro, no es lo mismo hablar una sola lengua (pongamos por caso el inglés, si no te parece mal) a lo largo de todo el territorio, que verse en la tesitura de tener que emplear dos o tres idiomas (o cuatro, ya puestos) según por dónde te muevas. Y lo del chino no deja de ser curioso, pero nada más, y no deseo ofender a nadie, que conste. I gather you didn't grow up in continental Europe (though you are right that Chinese isn't influential here, either). Speaking the three official languages of Belgium I never ceased to be amazed by how many eastern European politicians speak fluent German on TV, and how many "southerners" (Italians, Iberians, Romanians, etc.) prefer French. — Speaking one language rarely means not speaking another one. British and American English speakers are not known for speaking other languages, it's true. But, as I've said above, English doesn't belong to the Brits or Americans anymore. I do have a concern that certain politicians may turn people the world over off English, but I think its usefulness far outweighs this negative possibility. But let's see. Whatever happens, it will be linguistically interesting. Jane, it is not so much a question of usefulness but of attractiveness, and this language rocks! I appreciate your framing the discussion around the notion that there are "varieties of English." As a native British English speaker who has spent the last 20 years in the US, regularly working with colleagues in Canada and Australia, I've become acutely aware of the variations. When I visit my family in England, they often "accuse" me of having developed an "American accent" and that I should "talk proper English" like they do. Mind you, they're all from Lancashire and any variations of English outside the county borders is "foreign!" Isn't English besides Maltese also an official language? For a language being official in one of the EU member countries doesn't mean it automatically is an official language of the EU. 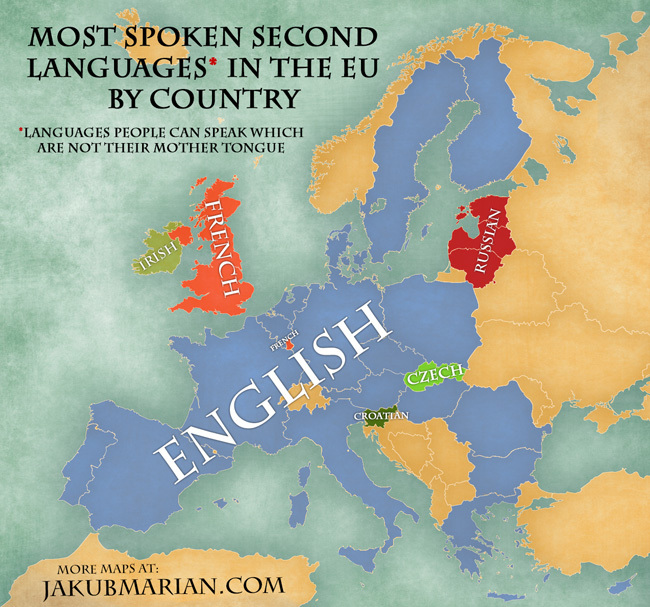 This is true for Luxembourgish (Luxembourg) and Turkish (Cyprus). I didn't notice anyone making this point so here goes (although it's understood in Kraut's comment). For a language to be official usually means it has a special status protected by legislation or constitution, with stipulations concerning access and usage in specified situations. So Brexit could mean the loss of e.g. publication of official EU documents in English, and loss of translation and interpreting services. That doesn't affect English continuing as a lingua franca among EU members, used by EU officials and delegates among themselves. It seems the UK is the member unit, so NI or Scotland cannot remain while England leaves. Brexit is concealing a severe constitutional crisis in the UK since only England voted to leave, and the English are taking it for granted that the Irish and Scots will leave too, perhaps with a little persuasion from the SAS. But that's not a language issue so 'nuff said. There are other issues affected by Brexit, and of interest to this blog and its readers. One is the coordination and evaluation of university degrees throughout the EU. The UK will presumably not participate after leaving the EU. Another is the EU-wide research cooperation between universities with EU funding. The UK will presumably be excluded from this funding and cooperation. UK phoneticians have contributed to these research projects, enjoying the funding and the opportunities to work with colleagues in other EU countries, but no longer. I believe it is likely to continue as a 'working' language at minimum. Where other Brexit issues are concerned, this is not the place to discuss them, IMO. I do have opinions and I find the general situation lamentable, but this blog is about language issues. You dream to build your house, start your own business, erase all the credits that are in your name in banks or financial institutions, you want to buy your car or others ... I certify that you will benefit from the loan that you want without protocol. So far the EU member states have been unable to agree upon a lingua franca that is taught to all children at kindergartens and schools throughout the Union and also serves as a unionwide additional official language at national and local government level. One of the reasons why, in spite of the prestige enjoyed by English in most of Europe, no such thing happened was an understandable fear of British linguistic (hence, cultural, political and economic) supremacy over the mainlanders. With Britain leaving the EU those fears might be reduced to some extent and the use of English in the EU even be expanded. I am not saying that this is going to happen, but it is one of the numerous possible scenarios. Yes, that's certainly a possibility - although I can see the French in particular not being keen on that. I found your blog truly worthwhile. The way you decipher your insight into this noteworthy articles is plainly appreciable. I am obliged to you for sharing such valuable and informative articles here publicly. Continue writing. One can learn and speak English in an effective way, just by downloading English Learning App on your own smartphone, which you can use whenever and wherever you want to practice your communication skills with experts.